THE MISSING PICTURE is about as arthouse a movie as you can get. It's the moving true life story of writer-director Rithy Panh, and with it, of Cambodia under the brutal military dictatorship of the Khmer Rouge. The arthouse aspect is to depict this tale by juxtaposing propaganda movies of the time with clay models depicting what really happened. Those models aren't animated - they are tableaux, and we are the animators who move through the tableaux as the camera moves. In fact, our complicity in the animation starts with opening shots, as we see celluloid reels disintegrate and the narrator (Randal Douc) tells us of the director's difficulty in finding an actual picture of what really happened. He is then forced into his clay models, and we even see the sculptor create them, starting movingly with the director's father. The resulting movie is challenging to watch. It's a brutal retelling of a brutal regime. Somehow, the use of models doesn't trivialise it. In fact, the juxtaposition of smiling footage of Pol Pot moving through adoring crowds with models of people starving, bent over, working on futile projects, is shocking and affecting. This movie is not for the faint of heart, and those looking for conventional storytelling. It is, however, deeply affecting and worth watching. THE MISSING PICTURE has a running time of 90 minutes. 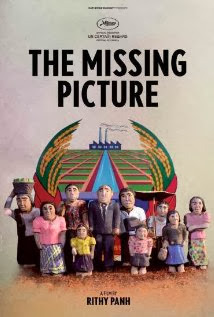 THE MISSING PICTURE played the Cannes Film Festival, where it won the Un Certain Regard prize. It also played Toronto, San Sebastian and London 2013.